Have you noticed that many ​crockpot recipes use canned condensed soups, soup and salad dressing mixes, and big chunks of meat? All of those ingredients make delicious recipes, of course, but will add a lot of sodium and fat to your meal. Having a good selection of healthy crock pot recipes that are low-sodium, nutrient dense, and low-fat will not only be better for your family but will also make you a better cook. There are things you can do to update your regular slow cooker recipes to be healthier. If you refrigerate canned broths before using them, the fat will congeal in a layer on top so it can be removed before adding to the recipe. Also, use low-sodium and low-fat ingredients, and trim the fat and skin from meats before cooking. You also may want to try vegetarian recipes once a week, or add lots of veggies to any crockpot recipe—any recipe that uses a lot of fresh vegetables will be healthier than one with processed ingredients. This delicious slow cooker pork roast with vegetables is seasoned with allspice, horseradish, and apple butter. The combination of sweet and savory (with a little bite) makes for a unique and satisfying dish. And best yet, a pork sirloin roast is a lot leaner than beef, and the addition of a whole acorn squash and two sweet potatoes make the dish high in Vitamin C and B6. Barley is chewy and nutty and so good for you. This delicious and healthy crockpot barley casserole recipe can be served as a vegetarian main dish or a side dish. Chock full of fresh vegetables such as onion, garlic, peppers, and mushrooms, as well as plenty of herbs, this dish is hearty and filling. The sprinkling of pine nuts at the end adds just the right crunch. ​This simple crockpot beef stew recipe uses just a few ingredients, yet it's healthy and tastes so good. The potatoes add a bit of natural creaminess, and the canned tomatoes and frozen bell peppers and onions bring nutrients and flavor to the stew. This easy and healthy slow cooker beef fajita stew is high in protein, fiber, and vitamin C. This recipe calls for either store-bought fajita seasoning (use the lower sodium version), or your own homemade fajita seasoning mix, which allows you to control the amount of salt. Cooking flank steak in your crockpot makes the most tender, juicy, and flavorful meat. Once cooked, make sure that you cut the meat against the grain for best results. This delicious Southwest crockpot steak and beans stew is full of nutritious vegetables and beans with flavors of the Southwest from the addition of salsa and chili powder. Tart apples, apple juice, curry powder, and garlic combine to create this unique and delicious crockpot chicken and apples dish that is easy to make. The curry adds another layer of flavor and makes the recipe somewhat reminiscent of the Indian dish chicken Mughlai. Serve over rice, couscous, or pasta to soak up the sauce. Beef stew doesn't have to be full of fat and loaded with salt. This healthy crockpot beef stew features green beans, carrots, and red wine to add flavor and color to this simple dish. Feel free to add more vegetables such as mushrooms, zucchini, corn, or potatoes to up the nutrients as well as the flavor. This colorful crockpot black bean chili is easy to make and sure to please even the meat-eaters, as it's full of flavor. Vegetable broth combines with lots of seasonings including cumin, chili powder, and red pepper flakes, as well as bell peppers, corn, and black beans to make a thick chili with deep flavor—and lots of nutrients! Cacciatore means "hunter" in Italian, and when a dish is alla cacciatore it means it is prepared "hunter style," with onions, tomatoes, and herbs, the sauce cooked with either chicken or rabbit. A thick tomato sauce coats tender boneless chicken in this easy and healthy crockpot chicken cacciatore recipe. Curry is the term used to describe both a blend of spices as well as dishes that are cooked in a sort of gravy. In this crockpot chicken curry recipe, purchased curry powder adds richness and color to a melange of vegetables and chicken. Onion, garlic, ginger, cinnamon, and red pepper flakes round out the dish, creating a delicious yet complex flavor. Perfect when you're craving a comforting dish but don't want to feel guilty afterword, this rich-tasting entree is actually low in fat, and very high in Vitamin A and potassium. It is the light sour cream that gives the dish its thick and creamy texture, and Dijon mustard and honey that create the sweet and tangy flavors. This crockpot creamy chicken and veggies recipe calls for carrots but is ideal for adding other favorites such as broccoli. Chock full of vegetables and herbs, this is a sausage and peppers dish you can feel good about. Swap the pork sausage for chicken or turkey, and you will cut the fat even more. This slow cooker Italian sausage and peppers recipe is fabulous and served over some fettuccine cooked al dente. This crockpot roast beef dinner recipe is tender and delicious, and it's a meal in one pot. Complete with potatoes, carrots, onions, and garlic, this dish has all the makings of a traditional roast beef dinner. Feel free, however, to throw in some other vegetables if so desired—parsnips and mushrooms would complement the meat nicely. 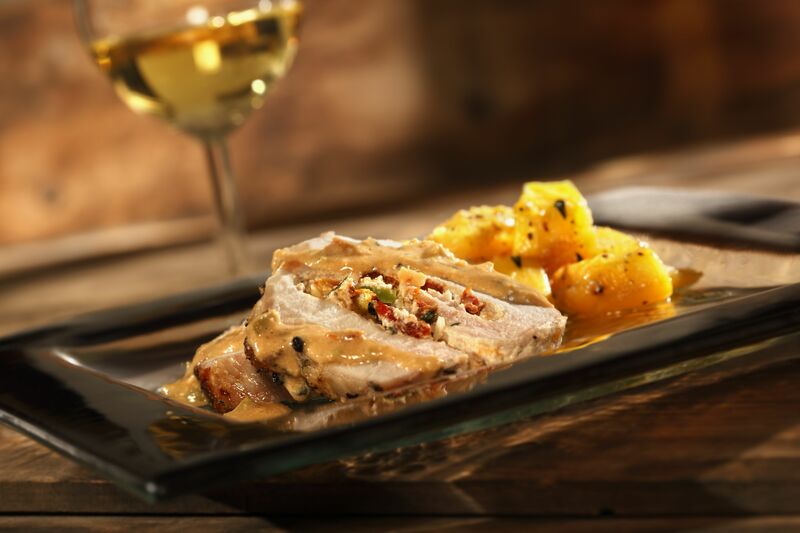 Frozen orange juice concentrate is the secret ingredient, providing a bit of tang and sweetness in this easy five-ingredient slow cooker orange roast pork recipe. The pork becomes tender and juicy​ and is the ideal meat for the sauce made of orange juice and brown sugar. This crockpot turkey breast is a great way to cook a turkey when it's not Thanksgiving! You'll have a fabulous meal, as well as leftovers for great sandwiches all week long. No worrying about taking up space in the oven and checking for doneness—just put the fully thawed turkey breast in the slow cooker and let it do its thing for five to six hours! This crockpot turkey meatloaf starts with ground turkey. (Be sure to buy mixed dark and white meat ground turkey for best results.) Forget about dried out meatloaf—the slow cooker guarantees a moist meatloaf the whole family will love.